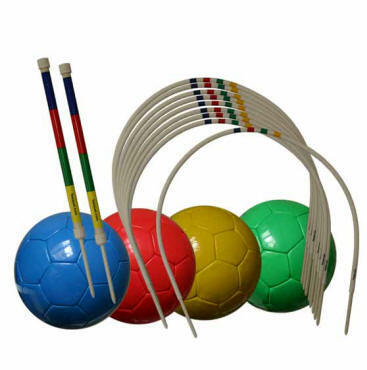 The Toequet Company offers for sale on this page everything you need to enjoy these exciting new wicket games, including sets, separates, and accessories. Our Wicket Set consists of 9 wickets, 2 stakes, and rules for both 6-wicket and 9-wicket games. The wickets are attractive, sturdy, durable, and custom designed for easy setup and takedown. They are 48" long flexible thick-wall tubing with rugged fiberglass ground spikes. The fiberglass rod extends out the bottom of the wicket for instant and easy insertion into the ground. Your play is enriched with our 'Ball Set' of brightly colored blue, red, green and yellow #5 soccer balls. Our regulation-weight mallets transform your Toequet set into a MalletBall set, and you can’t beat the prices at $50 to $60 each (when bought in sets of two or more). The Universal weighs about 2 1/2 pounds with a 28-inch shaft, a nine-inch head and a wide face to enable you to get a square hit on the ball; it works well for any kind of croquet and for short as well as tall people, hence the name, Universal. Our slightly heavier and absolutely unique Monster mallet is designed to produce optimum results in a variety of shots, with a broad flat face as well as a lofting face; its long 36-inch shaft helps to generate maximum power and distance in the drive shot using the golf swing. The X-treme Game set makes you the star of any outdoor party and a special events entrepreneur, allowing 16 people to simultaneously play one or more of your favorite wicket games. It’s the starter set given to all our Area Reps and the one we recommend to recreation centers and schools. Designed specifically to convert your standard Toequet set into Malletball. These solid ash mallets feature an oversized solid wood head with the largest striking face available. 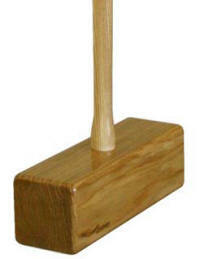 This mallet measures 28" tall with a 9 inch long head. The head and shaft are connected with the Oakley Woods Croquet unique 'TaperLock' fastening system, allowing for quick & easy dismantling. Weight is 2-1/2 lbs. If you click on the ADD TO CART button you will be taken to a secure server to complete the ordering process. 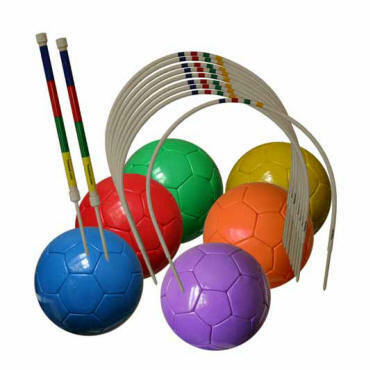 The ordering is done through The Toequet Company's sister website, The Croquet Store.